Where on Earth Does Lightning Flash Most? According to satellite observations summarized in the following map, lightning occurs more often over land than over the oceans and more often closer to the equator. 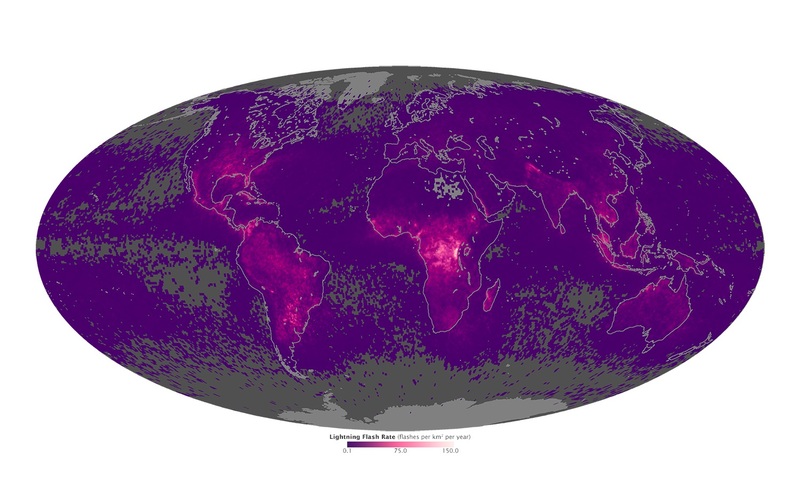 The map above shows the average yearly counts of lightning flashes per square kilometer from 1995 to 2013. The map was created using data collected from 1998–2013 by the Lightning Imaging Sensor (LIS) on NASA’s Tropical Rainfall Measuring Mission satellite, and from 1995–2000 by the Optical Transient Detector (OTD) on the OrbView 1/Microlab satellite. Flashes above 38 degrees North were observed by OTD only, as the satellite flew to higher latitudes. Areas with the fewest number of flashes each year are gray or purple; areas with the largest number of lightning flashes—as many as 150 per year per square kilometer—are bright pink. Be careful where you pitch your tent if you go on safari in central Africa.